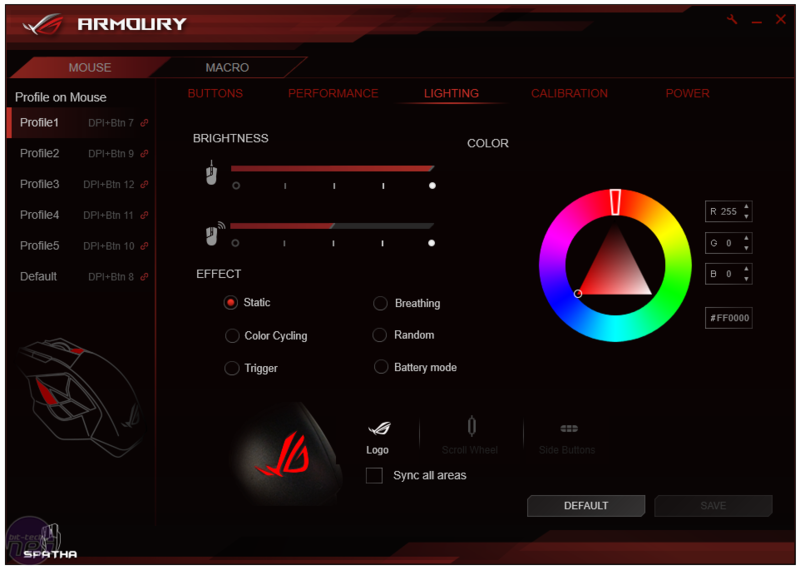 To really utilise the Spatha's features, you'll need to install the ROG Armoury software. 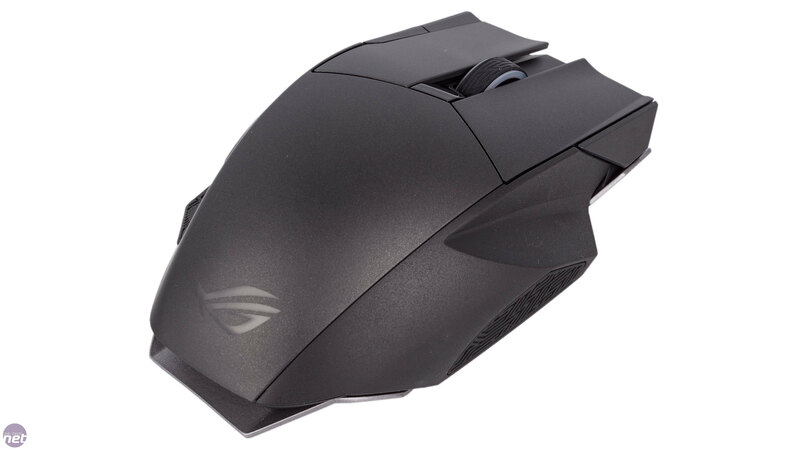 However, unlike Razer's Mamba mouse, the Spatha saves all of its settings onboard and you don't need the software running once you're done tweaking, which makes it great for LAN use. 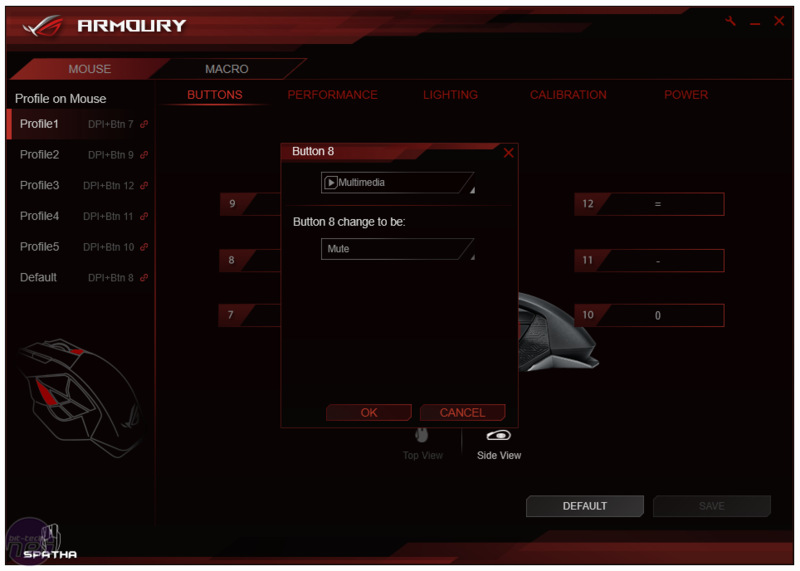 As well as a default profile, in which zero customisations can be made, there are five custom ones. 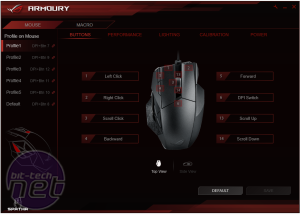 These six profiles can be switched between using the DPI button plus one of the six thumb buttons, so literally all of your settings are right at your fingertips – useful if you play as a different character or class within the same game, for example. 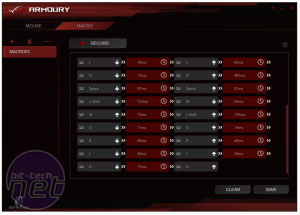 All 12 buttons as well as the scroll up and down commands can be customised, although the latter cannot be used for macros. Still, mouse functions, keyboard functions, Windows shortcuts and media controls can all be selected easily via the intuitive button map and drop-down menus. A separate macro editor lets you create, delete and import macros with ease. Mouse movements cannot be recorded, though that's not really a limitation, but all buttons and keyboard commands can be. 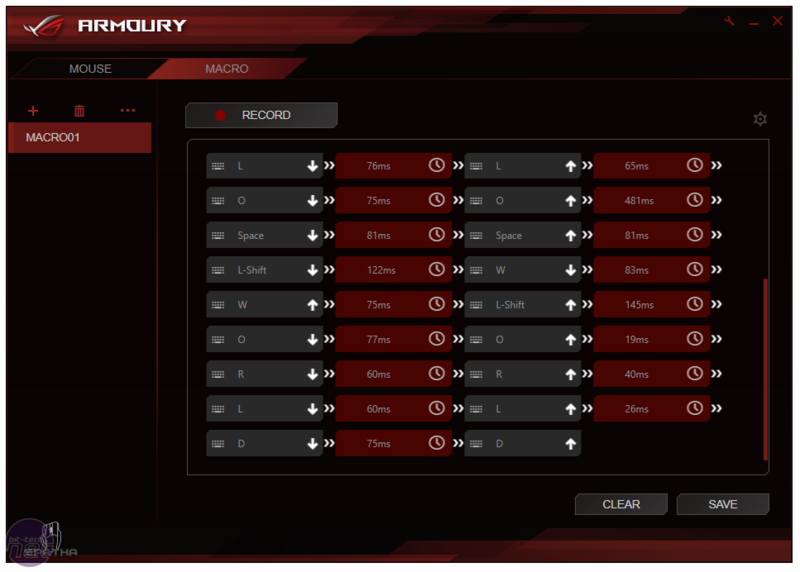 You can also choose whether or not to record delays (or set a fixed one) and playback options include once, loop x number of times or loop endlessly. The sensor is capable of tracking at up to 8,200 DPI. 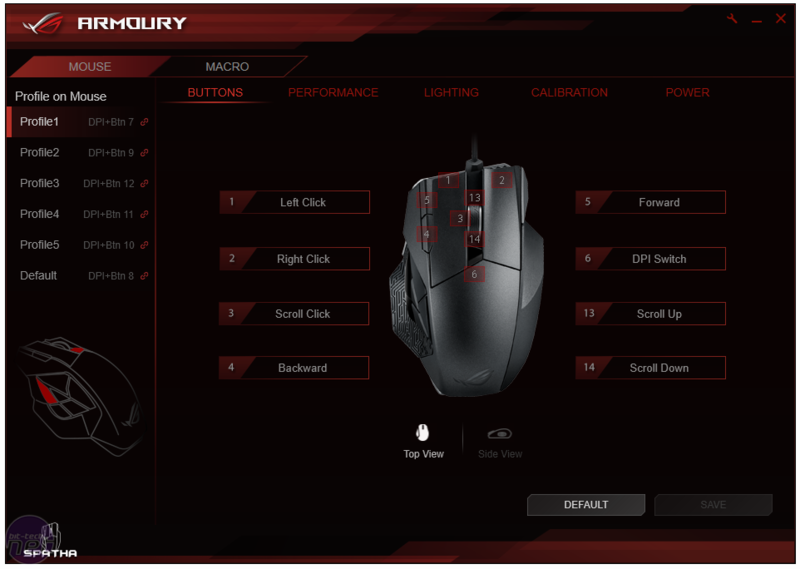 In a pure numbers game, this pales in comparison to the 16,000 DPI offered by the Razer Mamba, but in reality you're unlikely to use either of these settings. At realistic levels, performance from the sensor here is fine – we didn't spot any issues during gaming or our highly technical Microsoft Paint tests. Performance can also be tweak in numerous ways. 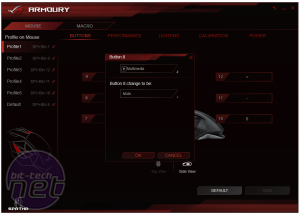 Each profile can store two DPI settings, one 'light off' setting and one 'light on' setting which is triggered with the DPI toggle and turns on a small white light just behind the button for visual feedback. Two settings isn't a lot these days, but honestly we've always found it to be the right amount, and with the five profiles there are technically 10 custom settings available anyway. DPI can be set to any value between 50 and 8,200 in 50 DPI increments. You can also tweak the polling rate, which is a fairly standard maximum of 1,000Hz in wireless mode or 2,000Hz when wired. 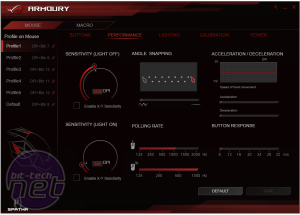 There's a button response setting, but we didn't notice any difference with these settings, and you can also alter the angle snapping, acceleration and deceleration of the sensor. For the most precise tracking, these settings are best left alone at their default (i.e. zero), but the options are there if you want them. The sensor's lift-off distance appears to be somewhere between one and two optical discs in height, which isn't bad, though this isn't exactly a mouse you'll want to be frequently lifting up and down given the weight. 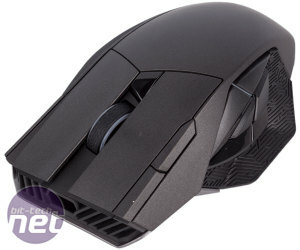 A high-end mouse these days would look pretty silly without RGB lighting and indeed the Spatha offers it in three independent zones – the scroll wheel, thumb button area and rear ROG logo. 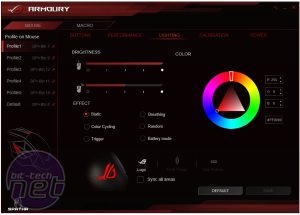 The ability to set different brightness levels for wired and wireless modes is sensible, and beyond that each zone can have its own brightness, effect and colour or you can synchronise them. 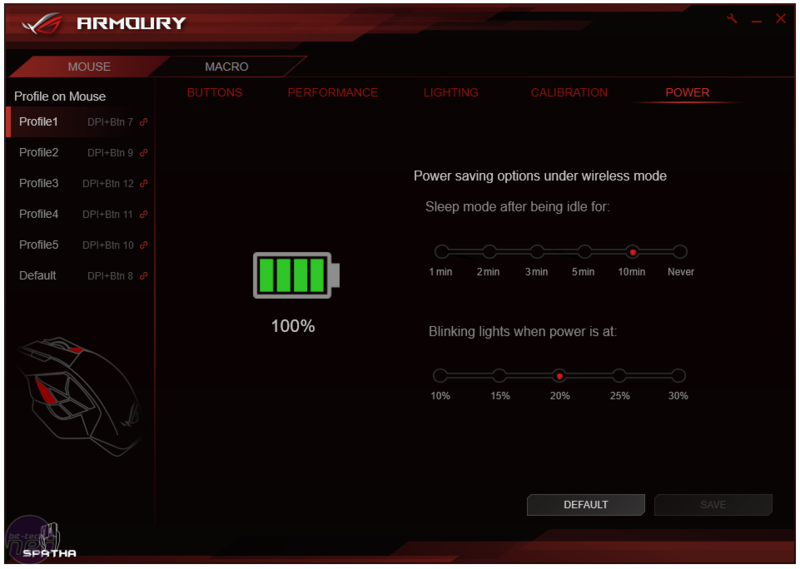 Although there is an LED battery indicator on the charging dock, the onboard LEDs can also be used to indicate battery status. 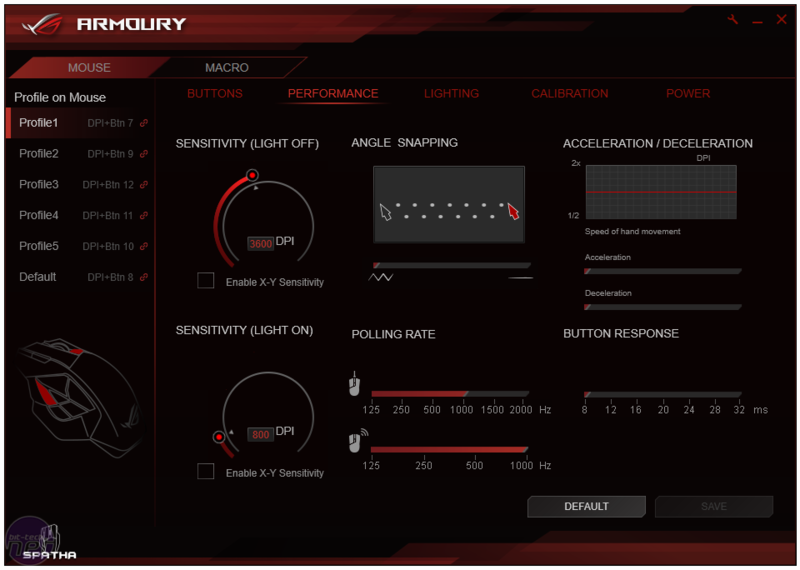 All in all, the Armoury software is solid with an easy to navigate menu structure and plenty of options to keep enthusiasts happy. 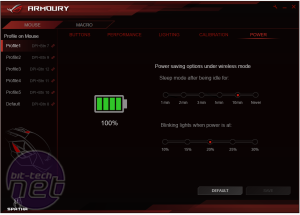 It takes a few moments to initialise when you open it, and it did crash on us once during testing – Razer has the upper hand on slickness – but these are minor niggles. 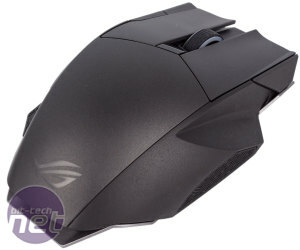 The Spatha is one of the most expensive mice on the market. Clearly, it's not for everyone, but for dedicated MMO players it's certainly likely to prove desirable. 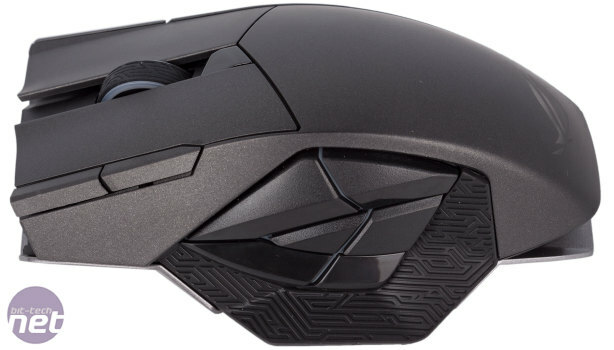 The weight, shape and button layout all lend themselves well to such players, although that's not to say you couldn't successfully use this mouse in an FPS or other genre, as it's still comfortable and a great performer. There's very little it doesn't have, and more importantly everything it does do (which is a lot) it does with finesse – quality is high all round, which is rare for something so packed with features. That feature list does result in a large and heavy mouse, however. 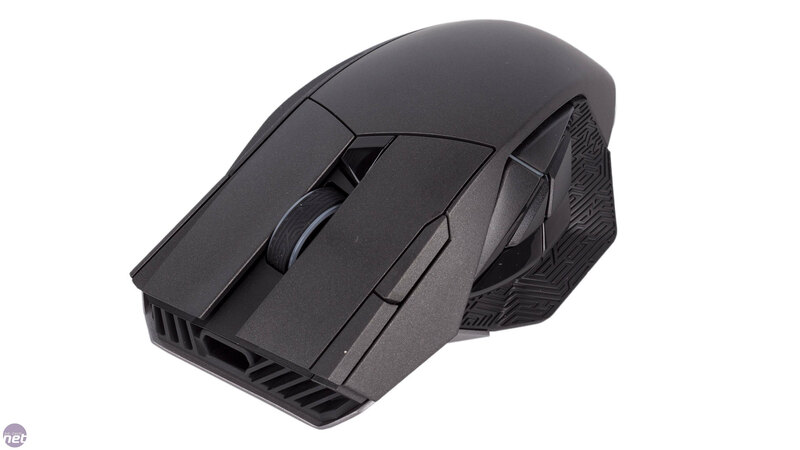 Users with smaller hands might struggle a little to adjust, and the thumb buttons take some getting used to, but once you're there you'll have an incredibly powerful mouse with dozens of commands at your fingertips. 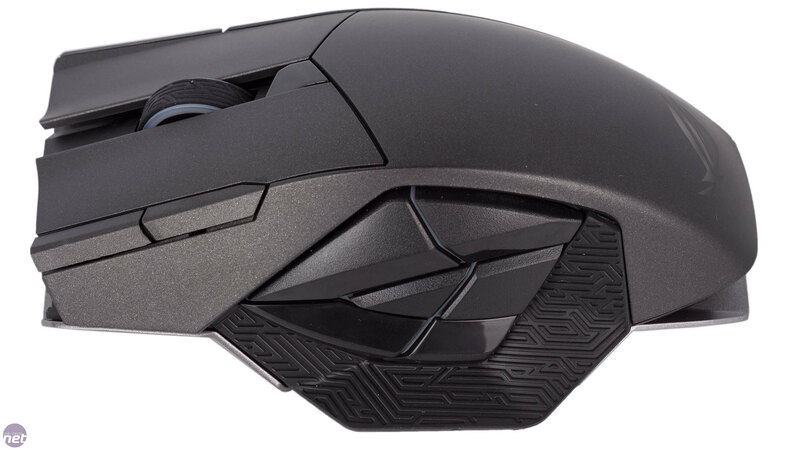 Between this and the Mamba, we'd say the physical design of Razer's mouse makes it a better general purpose mouse, but for MMOs and other games where multiple macros are an advantage and for players who love using a palm grip with a big mouse this clearly takes the edge and is another example of a well-focussed design from the Asus ROG team.